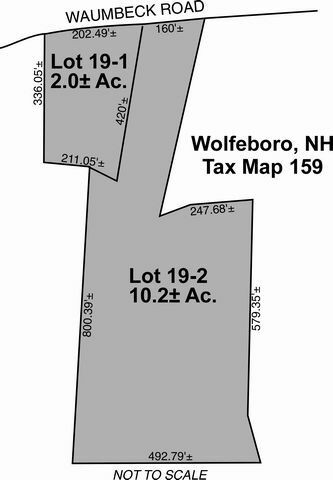 WAUMBECK ROAD, TAX MAP 159 LOTS 19-1 & 19-2, WOLFEBORO, NH. These adjacent lots of land are located in a quiet country setting off Route 109 just minutes to Lake Winnipesaukee and the center of town. Rural Zoning District. Public water available at street. Tax Map 159, Lot 19-1, Waumbeck Road. This 2± acre lot has 202.49± FF, is mostly cleared, and is level to roll¬ing in topography. The lot features a horse field with strip paddock fencing and a 2-stall barn. Ad valorem assessed value: $56,900. 2017 taxes: $821. Tax Map 159, Lot 19-2, Waumbeck Road. This vacant, wooded 10.2± acre lot is rolling to sloping in topography and has 160± FF. Ad Valorem assessed value: $64,300. 2017 taxes: $655. Mortgagee reserves the right to offer the lots individually and/or in the entirety. Mortgage Ref: Carroll County Registry of Deeds Book 2733, Page 616. Sale per order of Mortgagee by its Attorneys: Minkow & Mahoney Mullen, P.A., Laconia, NH; Peter J. Minkow, Esq. Terms: $5,000 deposit per lot by cash, certified check, bank check, or other form of payment acceptable to Mortgagee at time of sale, balance due within 45 days. Other terms may be announced at time of sale. All information herein is believed but not warranted to be correct. The Mortgagee does not warrant the condition or existence of any feature described above. Full Description: WAUMBECK ROAD, TAX MAP 159 LOTS 19-1 & 19-2, WOLFEBORO, NH. These adjacent lots of land are located in a quiet country setting off Route 109 just minutes to Lake Winnipesaukee and the center of town. Rural Zoning District. Public water available at street. Tax Map 159, Lot 19-1, Waumbeck Road. This 2± acre lot has 202.49± FF, is mostly cleared, and is level to roll¬ing in topography. The lot features a horse field with strip paddock fencing and a 2-stall barn. Ad valorem assessed value: $56,900. 2017 taxes: $821. Tax Map 159, Lot 19-2, Waumbeck Road. This vacant, wooded 10.2± acre lot is rolling to sloping in topography and has 160± FF. Ad Valorem assessed value: $64,300. 2017 taxes: $655. Mortgagee reserves the right to offer the lots individually and/or in the entirety. Mortgage Ref: Carroll County Registry of Deeds Book 2733, Page 616. Sale per order of Mortgagee by its Attorneys: Minkow & Mahoney Mullen, P.A., Laconia, NH; Peter J. Minkow, Esq. Terms: $5,000 deposit per lot by cash, certified check, bank check, or other form of payment acceptable to Mortgagee at time of sale, balance due within 45 days. Other terms may be announced at time of sale. All information herein is believed but not warranted to be correct. The Mortgagee does not warrant the condition or existence of any feature described above.